Nearly $500 billion worth of food gets thrown away in the U.S. each year – while nearly 50 million Americans go hungry. A new app hopes to use peer-to-peer technology to connect people throwing away food with those who need it. We’ve seen the sharing economy dabble in foodsharing before. Platforms like Feastly and Josephine let everyday people become chefs for a day, by hosting pop-up dinners in their homes or preparing food-to-go for customers. But Unsung‘s goal is different. 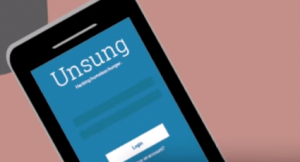 It hopes to use the sharing economy to address the hunger crisis. Think of it as the Food Not Bombs of the sharing economy era. How does it work? First, people with excess food – restaurants, grocery stores, individuals – post what they have available on the app. Then Unsung sends one of its volunteer drivers to collect the food and distribute it. These drivers can set their own schedule, and get badges based on how many meals they deliver. Recently, Unsung drivers in Baltimore and Austin competed to deliver 1000 meals as part of the #HackHunger challenge. If the idea of “competing” to feed hungry people sounds a little weird, well, that’s Silicon Valley for you. Several other apps take a different approach, avoiding the charity designation altogether and simply letting people buy excess food directly from restaurants. TooGoodToGo, which was founded in Denmark, will launch in New York City this year. Restaurants can list their leftover menu items, and customers can place an order for pick-up, at generally around 50% of the menu price. A Finnish app called Lunchie offers a similar service – it’s like ordering to-go food at a steep discount. Will these apps help address the food crisis in America? While each one may be only a drop in the bucket, it’s good to see the sharing economy turning its attention to food waste. Check out the intro video for Unsung below, and head on over to the website to deliver meals in your city. ← Why does this matter to me?